The most rewarding club in Carson City! Gold Dust West’s Gold Rewards Club is the club that gives you more. It’s your key to earning E-CASH rewards and comps, free entries into drawings, access to exciting promotions and tournaments, and a monthly mailer loaded with special offers. Be sure to use your card each time you play to earn more points and more benefits. If you’re not a member, stop by Guest Services today. The sooner you sign up, the sooner you can start cashing in on all the benefits! With our Gold Rewards Club, you’ll start winning right away! *Based on level of play. 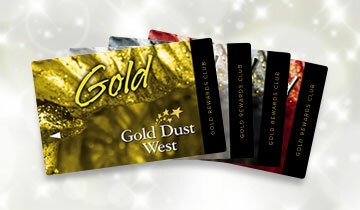 Gold Dust West’s Gold Rewards Card offers five card levels – Gold, Gold Plus, White Gold, Black Gold and Ultimate Gold. The more you play, the more points you’ll earn toward the next card level. The higher the card level, the more benefits you’ll unlock. Play and Stay with Gold Dust West. See what’s happening now at Gold Dust West. With our monthly events and giveaways, there’s even more ways to win. There’s always something going on at Your House Full of Friends!